2 - 1 ½ to 2 inch thick rib eye steak. Ask your butcher, he can cut them for you. The night before combine the shallot, garlic, thyme, wine and olive oil. Place steaks in a large zip lock bag, pour marinade over steaks, refrigerate overnight. One hour prior to grilling remove beef from marinade, pat dry and let stand at room temperature. Prepare barbecue (high heat). Sprinkle all over with salt and pepper. Place beef on grill; sear 2 minutes on each side. Reduce heat to medium-high. Grill uncovered until instant-read thermometer inserted into thickest part of beef registers 130°F for medium-rare, moving beef to cooler part of grill as needed to prevent burning, and turning occasionally. Transfer to platter; cover loosely with foil and let rest 15 minutes. Thinly slice beef crosswise. Serve with chimichurri sauce. Bring water and salt to a boil, remove from heat and let cool. Combine the next 5 ingredients into a bowl. Whisk in the vinegar then the oil, then the salted water. Place in a glass jar with a tight fitting lid and refrigerate. 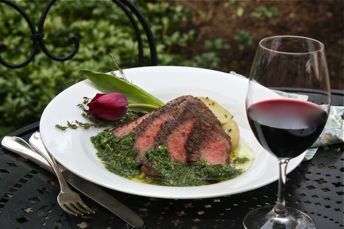 Chimichurri is best made the day before and will keep for 2 to 3 weeks in the refrigerator.